Though some of you may have noticed late in 2014, we're now making the official announcement. MIT App Inventor has been used in many countries (more than 195 at last count) for some time, but now the interface for the programming environment, found at http://ai2.appinventor.mit.edu/, is now available in more than just English. 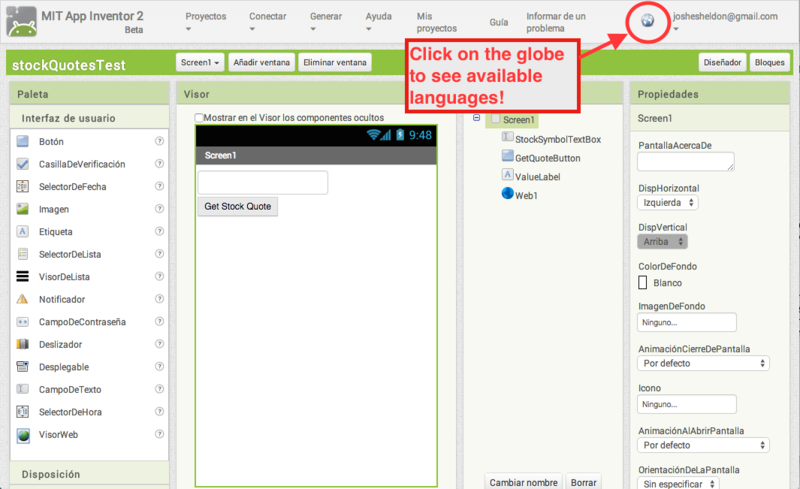 So far, we've released Spanish and Chinese (simplified and traditional) translations, accessible by clicking the globe icon in the top menu bar of MIT App Inventor. We're currently smoothing the rough edges from a process to allow volunteers to contribute to the translation efforts, either by improving existing translations or helping provide additional ones. We will publish additional information as soon as this process is ready for more widespread use. In the meantime, if you are interested in helping field test this translation process, please start here or send an email to localize-app-inventor@mit.edu.